Kansas is one of four states that require residents to show proof of citizenship when they register to vote using a federal form. A Kansas resident shows part of a letter from election officials listing valid citizenship documents needed to register to vote in Kansas. Now, the EAC's advisory board — composed of election officials from around the country — has approved a resolution saying that such changes should be made by the commissioners themselves. The resolution, passed by a 13-7 vote during a two-day board meeting in Chicago, is only advisory, but clearly shows dissatisfaction with Newby's actions. Commission Chairman Thomas Hicks says it's now up to the commission to take the recommendation "under advisement" and decide what to do. He, for one, agrees with the sentiment. Hicks, a Democrat, publicly criticized Newby earlier this year for making the change. Hicks noted in a statement that the commission had "addressed this matter several times over the last decade and voted to decline requests" to add language to the federal voter registration form requiring proof of citizenship. Right now, the form simply asks individuals to swear — upon penalty of law — that they are citizens. The two other commissioners, both Republican appointees, have not objected to the change. 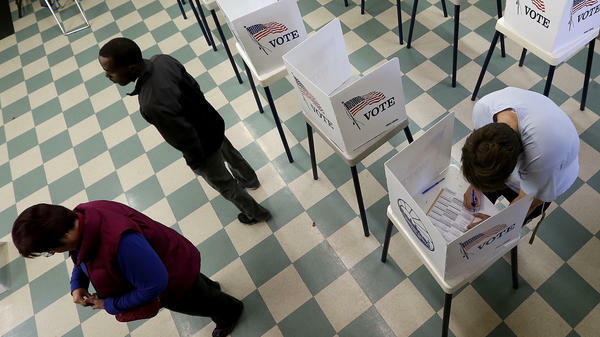 A fourth seat on the commission — which provides guidance to states on voting — remains open. Just last week, President Obama nominated former Nevada treasurer Kate Marshall to fill the vacancy. The EAC controversy is part of a bigger fight over Kansas Secretary of State Kris Kobach's move to require residents to prove citizenship when they register. Kobach says he's trying to prevent non-citizens from voting, although there's little evidence that's been a serious problem in the state. Voter advocacy groups argue that tens of thousands of Kansans have been blocked from registering to vote because they don't have the required documents, such as a birth certificate, to prove citizenship. They say Kobach's move violates federal law, and are suing him in federal court in Kansas City. The other suit — against Newby and the EAC — was filed in federal district court in Washington, D.C. In that one, the League of Women Voters is asking the judge to block the proof-of-citizenship requirement before Kansas holds a primary in August. A decision is expected any day. Newby argues that he has the authority to make the changes. But the fact that he is a former Kansas election official, with ties to Kobach, has raised suspicions among advocacy groups. At least two groups have asked the EAC's inspector general to investigate. 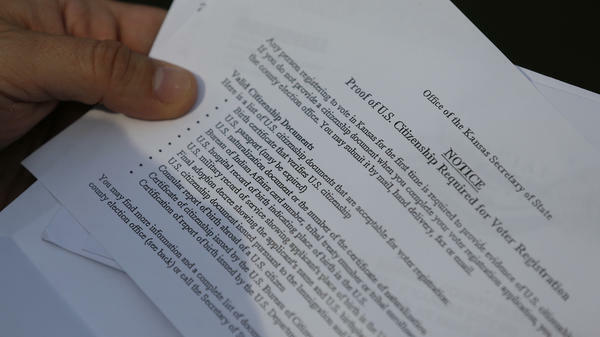 Republicans, who generally back proof-of-citizenship laws, are watching the legal wrangling closely. If Kobach wins, there will likely be more legislation requiring voters to show such proof when they go to register.